The Minnesota Hospital Association recently honored 18 programs for innovation, excellence, volunteerism, and patient safety. Urban Scrubs Camp, a program supported by Augsburg College that provides youths the chance to learn about a range of career options in the health care industry, won the 2012 Health Care Career Promotion Award. "A few years ago, Augsburg joined neighboring institutions to explore how to leverage our gifts and resources to improve the Cedar-Riverside neighborhood," said Paul C. Pribbenow, president of Augsburg College. "One outcome was the formation of the Cedar-Riverside Partnership, which provides a forum for institutions and organizations invested in the neighborhood to work together on issues of shared interest. The idea for Urban Scrubs Camp emerged from our common interest in workforce development and in providing positive opportunities for neighborhood youth." Augsburg's commitment to the Cedar-Riverside Partnership is reflected in the College's role as an anchor institution—as an organization closely tied to place, with strong interest in improving the health and vitality of the community in which it is located. The work also is tied to the College's role as a Lutheran organization with a calling to serve its neighbors. "As an anchor institution called to help shape the future of our neighborhood, we have the responsibility to creatively use institutional resources to further the mission of the College while also creating shared value in our community," said Steve Peacock, director of Augsburg community relations. "The College creates this shared value by providing the camp with access to Augsburg's facilities, faculty, staff and students. The end result is a positive, campus-based experience for talented high school youths, some of whom are from the neighborhood and sponsored by local organizations and businesses, and whom we hope will consider Augsburg as they think about College." Augsburg faculty and staff deliver some programming for the camp, and some Auggie students serve as counselors. Last year, students learned from faculty about the work of physician assistants, anatomy and physiology, water quality testing, and addiction counseling. 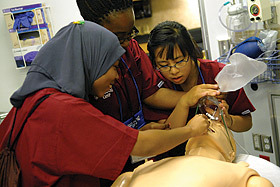 Urban Scrubs Camp, which runs from July 9-13 this year, annually provides 70 campers with a five-day, hands-on opportunity to focus on a variety of healthcare career options. The camp also helps address workforce development needs for local hospitals, and strengthens relationships with community partners. The camp is possible through the work of Augsburg and the Cedar-Riverside Partnership, and by efforts of HealthForce Minnesota, Fairview Health Services, the Minnesota Urban Health Education and the University of Minnesota. The Camp during 2011 enjoyed lead financial sponsorship from Boston Scientific.